By the time the gates to the Roger Williams Park Zoo open, at 10 a.m. sharp each day of the week, the zoo’s staff has already been hard at work for several hours. Some people arrive as early as 7 a.m. to begin preparing the zoo for the day ahead. As the animals wake up, keepers give them their breakfast and any needed medications, clean out their habitats, and perhaps do some training with the creatures. The operations and facilities crews walk through the 40-acre campus, making sure it’s spotless. The Roger Williams Park Zoo has 125 permanent staffers, and the payroll swells to about 400 during the busy season between April and October. People may encounter many of these workers during their visit, but can easily be unaware of the hard work that goes on behind the scenes. Animal care is a particularly large department. There are more than 100 different species in the zoo, and several new animals arrived this summer with the debut of the Faces of the Rainforest exhibit. Throughout the day, two veterinarians and their technicians conduct ongoing medical and dental exams, vaccinations, and other checkups to ensure that the animals are healthy. One area that visitors don’t see is the commissary. This is where Dr. Michael McBride, director of veterinary services, works with the animal care staff to determine what diet is appropriate for each animal. Occasionally, a special treat is included with the day’s meal; for example, the two-toed sloth is a big fan of scrambled eggs. Since the commissary is subject to the same regulations as a restaurant, a visitor may even think it looks like an eatery at first glance. But then you’d notice some things that wouldn’t go over so well with human visitors. “You’ll see a lot of produce, but there are also things like crickets and frozen mice,” says Nahabedian. 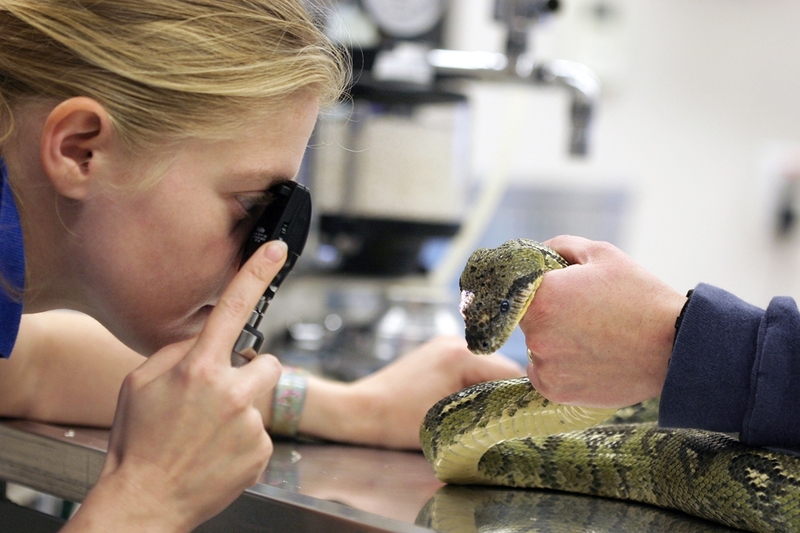 Some programs give visitors a glimpse at the often unseen responsibilities of animal care. In the Breakfast with the Moon Bears event, participants help keepers prepare a habitat for the day. Another morning program includes a tour of the elephant barn and the preparation of the pachyderms’ breakfast. In addition to the animal care staff, employees at the Roger Williams Park Zoo are involved in philanthropic efforts, educational outreach, public relations, financial management, and security. The zoo is part of the city of Providence, but managed by a not-for-profit organization. Nahabedian says the zoo’s executive director, Dr. Jeremy Goodman, has been vigorous in embracing conservation efforts as well as updates to make the zoo more environmentally friendly, up-to-date, and accessible. However, she says she sees this passion in other workers as well. For example, security personnel are focused on keeping visitors safe and helping respond to medical emergencies, but often know enough about the animals to chat with visitors about them. “I think it’s what makes us so spectacular as a zoo, is just the commitment to the animals and their conservation and the environment,” says Nahabedian. Once the zoo closes at 5 p.m., the keepers do another round of feedings and get the animals bunked down for the night. Security staffers check each building to make sure every visitor has left. Zoo employees sometimes stay for after-hours events, such as Brew at the Zoo or the Jack-o-Lantern Spectacular. Otherwise, the emergency response coordinator gives the all-clear to leave, and people start to head out around 6 p.m. While staffers don’t work overnight on a regular basis, some will stay behind if the weather forecast calls for a blizzard or other severe weather. During these special shifts, the staffers make sure the animals are doing well and address any other issues that might come up. For example, one of the March nor’easters took down some trees at the zoo, including one that fell on a concession stand. By the morning, operations staffers who had stayed overnight had cleared out the debris and repaired the damage. The next day’s visitors were probably unaware that there had even been a problem. The Roger Williams Park Zoo is located at 1000 Elmwood Ave. in Providence. For more information, call 401-785-3510 or visit rwpzoo.org.